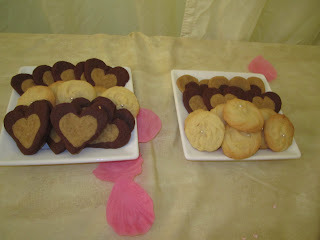 Here we have two biscuits, the classic melting moments and then some rather lovely coffee, chocolate and vanilla hearts. 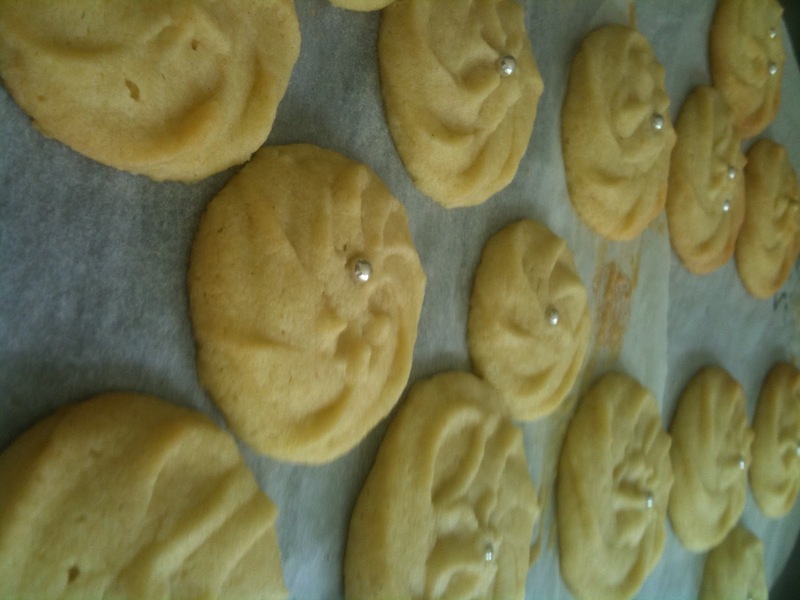 I made this on a meltingly hot day in June; I didn’t yet know the tip of putting melting moments in the freezer before baking, so they lost their shape during the bake. It was so hot they were already incredibly soft when piped. 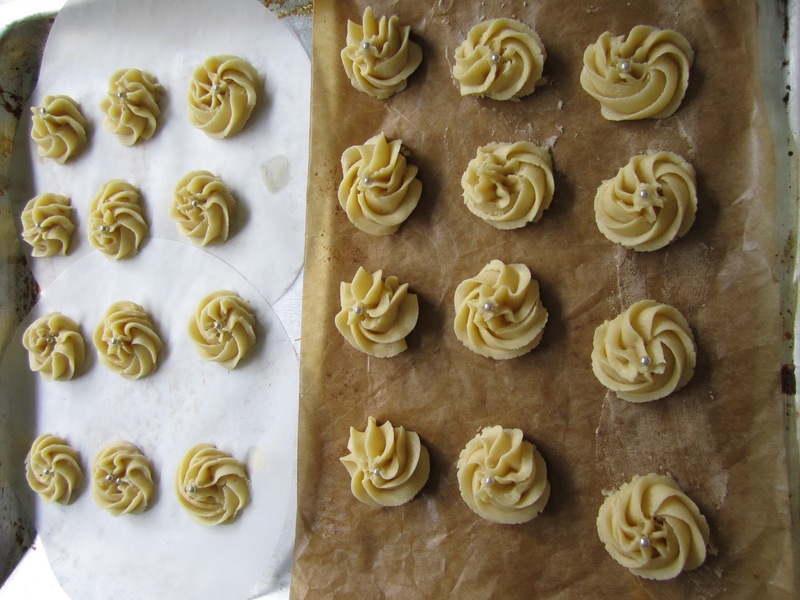 The freezing before baking is one of many nuggets of baking wisdom that I picked up from The Great British Bake Off. Ahh how much do I love that programme? lots and lots I can tell you. Anyway I hadn’t made melting moments in a few years and henceforth I think I shall try out lots of designs when I do make them. They are so easy to make and to pipe. And you can have a field day with decorating once you have piped them into whichever shape you like. Pipe fingers and dip in chocolate and sprinkle with edible decorations like glitter. 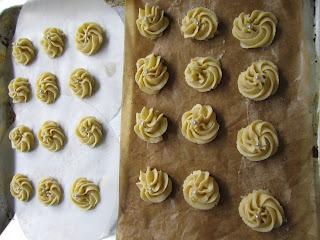 One of the contestants on The Great British Bake Off did a strip of food colouring down the side of the piping bag before putting the dough in so that when you piped the biscuits you got a pink swirl in the biscuit which looked very pretty. 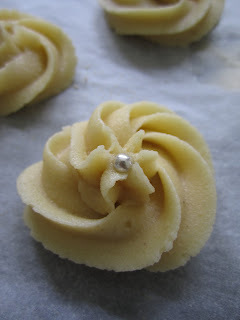 She also sandwiched two swirl biscuits together with a different buttercream icing to usual; one involving flour and milk cooked first and then adding this to the usual buttercream. I know this because, happily, I got The Great British Bake off Book for my recent birthday. The other biscuits are double heart cookies. They are from a great tome of a baking book that my husband bought back for me from one of his post-work supermarket trips (all sorts come back from those hungry trips!). The book is called 1001 cupcakes, cookies and other tempting treats and it is absolutely packed full of great biscuit recipes. (It was £5 in the supermarket, obviously my husband, rightly so, thought bargain!) It is the first thing I have made from there though are lots of pages marked with coloured tabs just waiting to be opened and cooked from and splattered with ingredients. Is that not one of the most fun things to do when you get a new cookbook-the leisurely reading through and marking of what you want to make?! 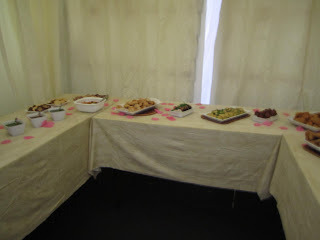 More about that soon in another post about my latest cookbooks I promise! The coffee part of the biscuit comes from a sachet of instant latte of all things, yep no upmarket espresso powder here, thought I suppose you could substitute with that if you were you wanted to make a more sophisticated biscuit for your other half, say to go with a chocolate mousse for desert after a romantic meal…..
You use two different sized heart cutters to cut them out and be careful to not roll the dough out too thin. I didn’t unfortunately take pictures mid-process but here is a pre-oven picture. You have to keep an eye on them once they are in the oven, they get done very quickly and all it takes is a few minutes extra for them to be overdone. 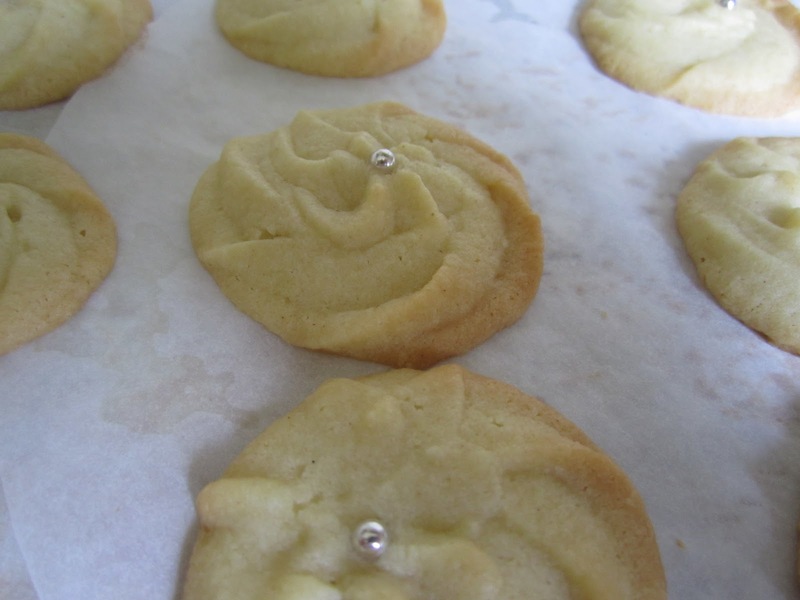 I speak from experience, I over baked my first batch-note to self –don’t go about baking hundreds of biscuits on a super-hot summers day with a 7 month old who decides to wake up just as the biscuits are due out of the oven…. Yep, I had trays and trays of biscuits that day and ran out of baking parchment, hence you can see in the pictures I am using my cake tin baking parchment rounds…..Anyhow we had lovely biscuits to eat at the end, even the crispy overdone ones got eaten one pre-wedding day dunked in tea as we took a break from wrapping the 10 thousandth wedding present for the bride…..
Place instant latte in a bowl with hot (not boiling water) to make a paste. Place the butter and sugar in a large bowl and beat together until light and fluffy, then beat in the egg yolk. Divide the mixture in half, beat in the latte paste, sift in 140g/5oz of the flour with half the salt and stir until combined. Shape the dough in to a ball, wrap in clingfilm and refrigerate for 30-60 minutes. Beat the vanilla extract into the other bowl, then sift together the remaining flour, cocoa powder and salt into the mixture. Again form a ball, wrap in clingfilm and refrigerate. Preheat oven to 190◦C/ 375◦C . Line two large baking sheets with baking paper. Roll out each ball of dough between baking parchment. 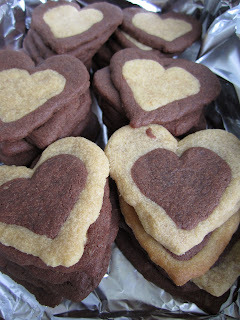 Cut out cookies with a large heart cutter and place on baking sheet well apart. Then use a smaller heart cutter and cut out the center of each heart and remove from baking sheet. 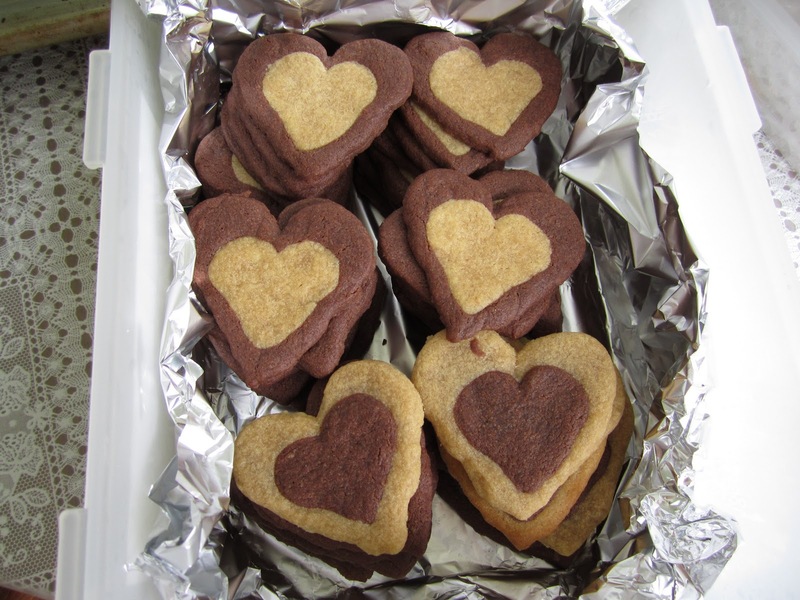 Place a small chocolate flavoured heart in the center of each large coffee-flavoured heart and vice versa. The book specifies 7 cm and 4-5 cm heart cutters but my cutters were smaller. Bake in preheated oven for 10-15 minutes. Leave to cool for 5-10 minutes, then transfer to wire racks to cool completely. You could vary the design by tinting one dough with food colouring for example pink! Also I used an instant latte that was vanilla flavour. Makes 64,32 if you sandwhich them together. Preheat oven to 180◦C/350◦. Line two large baking sheets with baking paper. Place butter and sugar in a large bowl and beat together until light and fluffy, then beat in the vanilla extract. Sift over the flour and cornflour and mix thoroughly. Spoon the mixture into a piping bag filled with a large star nozzle and pipe 32 biscuits onto each baking sheet spaced well apart. Put into the freezer to frim biscuits up for about 15 minutes. Bake in preheated oven for 15-20 minutes, or until golden brown. Leave to cool on the baking sheet. Bake in preheated oven for 15-20 mnutes or until golden brown. Leave to cool on baking sheet.